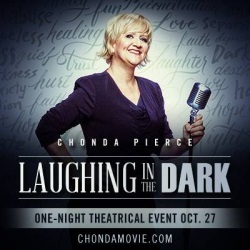 Denver, Colorado—Chonda Pierce: Laughing in the Dark, a one-night-only cinema event presented by Fathom Events and Fuseic Entertainment, will premier in select theaters around the country Tuesday, October 27, at 7 p.m. (all time zones). An encore presentation has been added for NOVEMBER 17, 2015, at 7 p.m.
A deeply personal glimpse into the life of Chonda Pierce, the groundbreaking Christian humorist and bestselling female comedian of all time, the film chronicles a series of tragic circumstances she has recently faced, including the loss of her husband. Leaning on her faith in a season of heartbreak, Pierce perseveres—her signature wit always intact—hoping to inspire and encourage others with her story. Andrew Tenenbaum, Pierce’s manager and producer of the film, adds, "This is a most special project for me, to be able to tell the true story of my dear friend Chonda in a way that will connect with millions who can find strength, courage and survival ... and hopefully a few great laughs." Click for more articles about Chonda Pierce.